Conducting field research always comes with its fair share of unexpected obstacles, and the 2018 season was no exception. 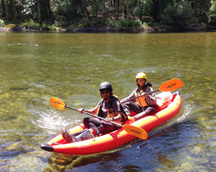 This year KBO began a new partnership with the Salmon River Restoration Council (SRRC) in northern California. The Salmon River has a long history of human impacts, particularly due to mining, and the SRRC has plans to restore several sites along the North and South Forks to improve watershed and stream health for fish and wildlife. KBO’s role is to study the abundance and reproductive success of birds before and after the restoration actions take place. Successful restoration would lead to more abundant and successfully reproducing bird populations—if not, KBO can advise on how to adjust the revegetation treatments to create better habitat for birds and other wildlife. Our first challenge arose when we arrived in Sawyers Bar in late April. With binoculars, GPS units, and clipboards in hand, we found to our dismay that river flows on the North Fork Salmon were higher than we anticipated early in the spring – too fast and cold to wade across safely. This called for a quick re-think of how our crew would even get to our field sites! We arranged for a swift water safety lesson from our partners at SRRC, borrowed some inflatable kayaks and life jackets, and learned how to secure them to our vehicle’s roof rack. The good news—paddling into your field sites is delightful! The bad news—getting up extra early to unload and inflate boats before our dawn survey start times is less delightful. Our intrepid crew adapted to these new challenges and took it all in stride. This crew and the work we did this field season was made possible by funding from the National Fish and Wildlife Foundation (NFWF) via a program called Developing the Next Generation of Conservationists. The program provides grant funding for youth from communities that are under-represented in the sciences to engage with the natural world and discover career opportunities available in conservation. We did exactly this as we trained the crew in nine different field methodologies (more than any past KBO crew! 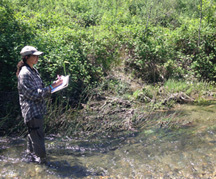 ), including territory mapping, target-netting and banding, collecting reproductive index data, and vegetation surveys. Both crew members identified learning about the types of careers available in biology or conservation, and gaining experience in multiple field techniques, as primary motivations for joining our program. As we tromped across riparian floodplains, mapping birds, swatting mosquitoes, and camping near beautiful rivers for nearly three months, the crew gained a realistic appreciation of what a career in field biology entails, and how the data they collect contribute to research goals and are applied to address conservation priorities. 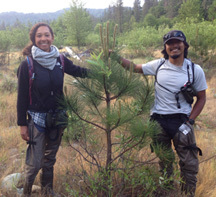 The NFWF program period has recently ended, and we thank Tessa Wardle and Alex Flores for their hard work this summer!